Dixie Horse & Mule Co is the ONLY dealership that has a personal relationship directly with over 20 banks and an in-house finance department. This allows us to quickly get the best financing possible for you and provide individual attention to each credit application and personal assistance throughout the purchase process. We look forward to earning your business! How long does it take to find out if I am approved? During weekdays we usually have an answer back from the banks within 2-3 hours, depending on the loads the banks have. We begin processing your application as soon as we receive it. What finance company do you use? Our Finance Department has worked hard to build one on one relationships with over 20 banks to get you the best rate and terms. Can you get financing for people with bad credit? Most of the time YES, we are able to get people approved that no other dealership can. Our Finance Department is trained and experienced in acquiring financing for all types of situations. We will go the extra mile to help get you in the trailer or truck of your choice. If we are unable to get financing for you, we will spend time with you to help you improve your credit. If you have concerns prior to filling out the application, you may contact one of our Credit Specialists at (877) 694-5665 ext. 127 or 123. Can you get financing for Canadian residents? At the time we do not have any banks that will finance in Canada. Most of our Canadian customers get financing through their local bank. 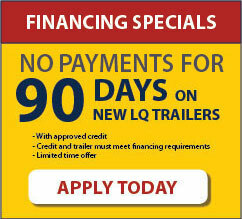 We will be happy to work with your bank on your trailer purchase.